It’s an interesting question and you’re probably thinking that your response is dependent on the day the question is asked. Some days you probably feel happier than others. Some days its hard to start feeling happy. We all have days when we’ve woken up on the “wrong side of the bed”. Where, from the minute you open your eyes in the morning, you feel grumpy. You don’t know why. You just do, and you know that you’re going to have a bad day. When you feel like that, it’s probably true! The shower water is too cold, your shirt has a button missing, you spill orange juice on your skirt, you hit every red light on the way into work only to arrive late… No wonder you’re in a bad mood! 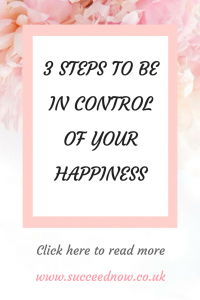 Let me rephrase my original question: Who’s in charge of your happiness? It’s true that you don’t have control of outside factors, but you are in control of how you react to them. If you wake up in a bad mood, it’s almost guaranteed that you’re going to have a bad day. Isn’t that a waste of a day though? I’ve read that a cold shower is good for the complexion, swap your shirt for another, put a jacket on to hide the stain and set off a bit earlier in case of delays. Its amazing what a change of perspective can do! Which of the days do you think turned out better? Staying positive doesn’t mean that bad things won’t happen. It means that the bad things aren’t going to spoil the rest of your day. It does take some effort to see the good when things seem to be going against you, but positivity is a choice. When you can’t control what is happening around you, control how you react to it. Its those times when you really don’t feel like it but yet you choose to be happy, that make the biggest difference. If you want to be happy, you have to be happy on purpose. Do you want to wake up and then see what sort of day you’re going to have, or do you want to be in control of your day and how you feel? Take a deep breath – take a moment to calm yourself down. Reflect on the situation – is it really as bad as you first thought? Reaction – now that you have taken a moment to put the situation into perspective, react appropriately. If something goes wrong have a bad 5 minutes not a bad 24 hours! Get it out of your system and then move past it and let it go. The power is within you and your way of thinking. Happiness isn’t something that is given to you by someone else or some external situation. Happiness comes from with you. Do you really want something external to be in charge of how you feel? Wake up earlier and have a morning routine to get you into the right mindset – read something positive, listen to a podcast, take some time to meditate or anything else that you enjoy and that outs you in a good mood for the day ahead. Let me know how you get on and how it improves your day? For more free support feel free to join the Community on Facebook. I couldn’t agree more…no one is responsible for your happiness except yourself! One of my goals for this month is to wake up earlier so I can have some quiet time to reflect & journal. Yoga also helps me stay balanced & happy! Great tips! This is such great advice! I will definitely be using this next time I’m feeling down. Thanks! Great post! You’re happiness is in your control..I agree with you. I think taking action after you asses the situation is he hardest part..at least for me. Good tips! What a great post! I’ve always been a positive person, but these reminders are excellent. As the years go by, you can go in and out of difficult seasons and this is like a refresher course in staying “refreshed”! Nice post! I absolutely love this post! I completely agree that each person is in charge of their own happiness. Life is not perfect, however, it’s your outlook on the imperfections that will shape how you move through life. Waking up earlier is definitely a great tip, and something I’ve struggled with forever. I do find that I when I wake up earlier, I am less rushed, and less stressed. I have more time to reflect and think. YESSSS! Putting things in perspective is the way to go, but so hard! It’s definitely something I am trying to work on in my journey to happiness. I tend to struggle with being a perfectionist and let that get the best of me. Being in control of your reaction to situations and your perspective on them, takes practice and of course it depends on the situation! The advice of taking a deep breath before reaction is always a great practice. It has always been true for me that happiness comes from the inside out. Reminding oneself of this at any point that we are triggered is key. 👍🏼 As an early riser, your point of waking up early totally resonates. ☀️Have a happy day! Taking a breath before you react gives you that moment to gather your thoughts. Its not easy though! You have written it very simply yet powerfully. Good or bad, day or whatever, depends much on not the day, but how we deal with the day or encounter the day. A little bit of preparation is necessary.